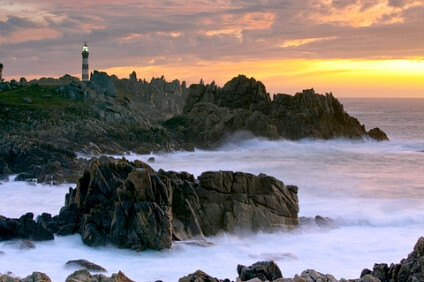 Ouessant Island at dusk, Brittany. A peninsula jutting into the Atlantic in northwest France, Brittany (Bretagne in French) is considered as one of the six Celtic nations (along with Cornwall, Wales, Manx, Scotland and Ireland). It has been known historically as Lesser or Little Britain (as opposed to Great Britain). The modern region of Brittany, smaller than cultural and historical Brittany, occupies a territory 27,208 km2 (10,505 sq mi), slightly less than Belgium or the US state of Maryland. With 3.1 million inhabitants, it is the 7th most populous French region - as well in fact as the 7th largest and 10th richest based on the GDP per capita. 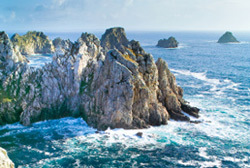 A rugged land with a dramatic coastline and a deep ancestral connection to the sea, Brittany has never felt really like the rest of France, nor truly French. Its culture and history is more tied to the British Isles or the northern coast of Spain. The Breton language, although only spoken by some 200,000 people today, still plays a major role in the region's cultural identity. Breton is a Celtic language more closely related to Cornish and Welsh than either of them are to Irish or Scottish Gaelic. The reason is that Brittany was resettled in the 5th century by Britons from what is now England, escaping the Anglo-Saxon invasions. Famous people from the present-day region of Brittany include (chronologically): the explorer Jacques Cartier, the writer François-René de Chateaubriand, and the Nobel Peace Prize-winning climatologist Jean Jouzel. Ever since the Neolithic, Brittany has had close ties with the Atlantic fringe of Europe, from Ireland to Portugal. 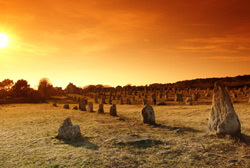 Brittany was one of the most important centres of the Megalithic culture, and the stone alignements at Carnac are the most extensive menhir collections on Earth. The Bronze Age witnessed the arrival of the Indo-Europeans (the Proto-Celts) from Central Europe, who brought the old Megalithic culture to an end. 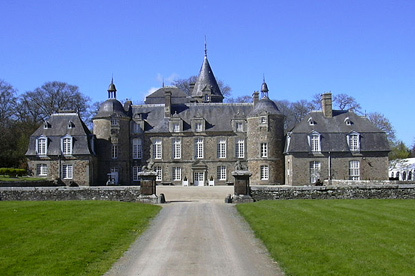 Brittany's rich mineral deposists, notably of gold and tin ore, were highly valued by the new Celtic elite. The region was known to the Romans as Armorica. Only after the British migrations of the 5th and 6th centuries did the peninsula acquire its modern name. A Kingdom of Brittany arose at the onset of the 7th century. Divided in three kingdoms (Vannes, Domnonée and Broërec), then reunited, Brittany becomes a vassal duchy of the Kingdom of France in 936. It would however remained de facto independent until the marriage of Anne of Brittany to Charles VIII of France in 1492, followed by the offcial Union of Brittany and France in 1532. Picturesquely sited in a valley, Dinan is an ideal historical town of half-timbered houses and stone ramparts complete with a massive medieval castle. Cap Fréhel is an extremely scenic and uninhabited peninsula covered in moorland and marshes. A charming historic town rich in Renaissance timber-framed and stone buildings. 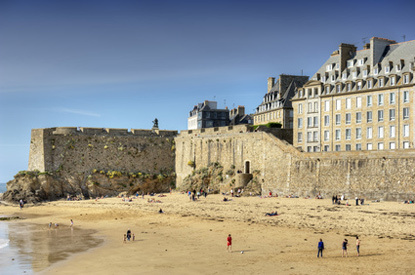 A historical city where traditional Breton culture still flourishes. 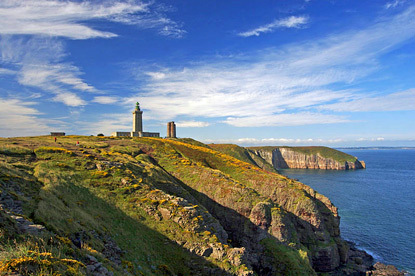 One of France's most scenic stretch of coastline, which includes Camaret-sur-Mer. Concarneau is Europe's largest tuna fishing port. It is famous for its Ville Close, a walled inner town dating from the 16th to 18th centuries. Douarnenez has long been famous for sardine fishing. Its old harbour, Port-Rhu, has been converted into a living, open-air maritime museum. 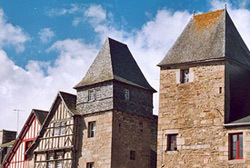 From the 14th to the 16th century, Locronan thrived as a production centre for hemp and linen used for sail manufacturing. 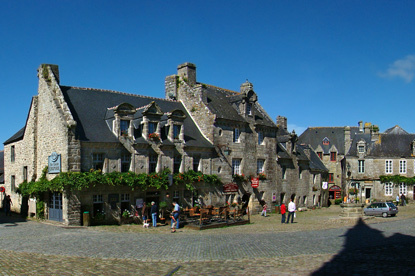 It has retained the atmosphere of this period and is now listed as one of the most beautiful villages of France. 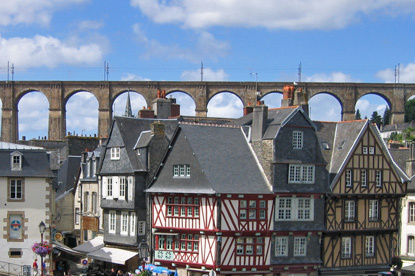 Built in a steep valley at the confluence of two rivers, Morlaix's townscape is dominated by its 58m-tall viaduct. 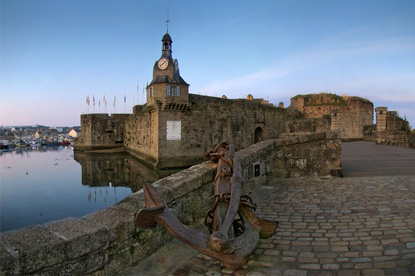 Superb walled port city, all made of stone, Saint-Malo was the home of French corsairs and privateers. Its Great Aquarium is the second most visited attraction in Brittany. 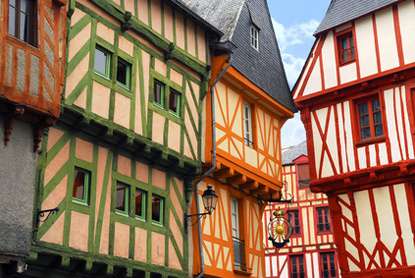 Vitré's fantastic medieval castle dominates one of the most beautiful towns in northern France. 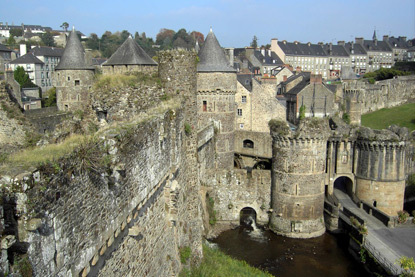 Once a stronghold at the confines of the Duchy of Brittany, Fougères was a heavily fortified town and is still endowed with one of France's great medieval castles. Built in the 16th century and refurbishe in the 18th, the Château de La Bourbansais has long been renowned for its formal French gardens. It now houses a private zoos with over 500 animals, including lions, Siberian tigers, giraffes, zebras, camels, monkeys and wolves. 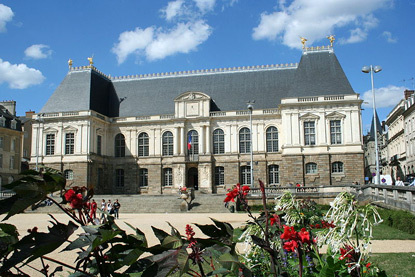 Rennes is the capital of Brittany and its largest city. Its architectural heritage spans the medieval, Renaissance, classical and baroque styles. 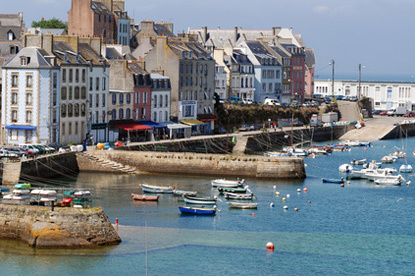 The small fishing town of Cancale is reputedly the oyster capital of France. 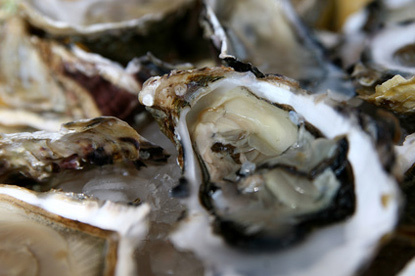 History has it that Louis XIV had his oysters brought to Versailles from Cancale. 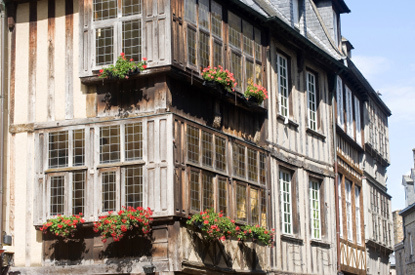 Facing the Gulf of Morbihan, Vannes is a delightful fortified city of timber-framed houses. Its name derives from the Veneti, a seafaring Celtic people. Resettled by the Romans, the town later became known as Gwened in Breton, a name akin to Gwynedd in Wales. Carnac has an exceptionally dense collection of megalithic monuments, including some 3,000 standing stones from the Neolithic period. 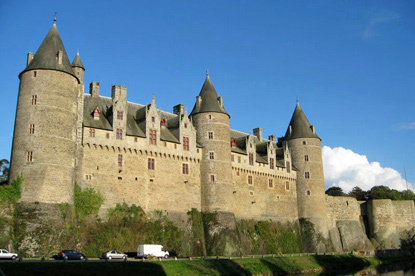 The impressive medieval Castle of Josselin, with its three round towers, has a history going back 1000 years. 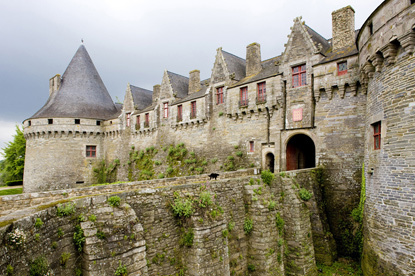 Once occupied by the Dukes of Brittany it has belonged to the House of Rohan for the last 500 years. Renovated in the 19th ccentury, it is now the home of the 14th duke. 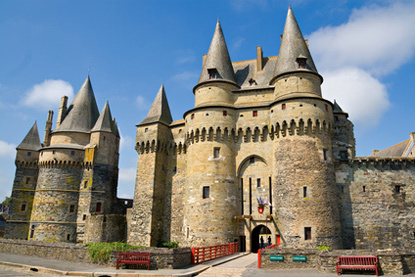 Dubbed the Castle of the Dukes of Rohan, Pontivy was erected in the 15th century and is one of the best-preserved medieval castles in France. 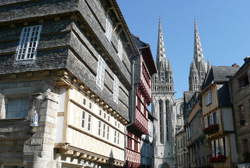 In 1940, Pontivy hosted the failed declaration of independence of Brittany organised by the Breton National Committee. 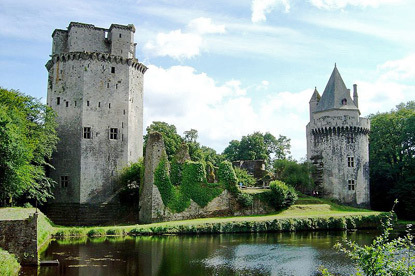 Former residence of the Dukes of Brittany, the moated Castle of Suscinio was abandoned in the 16th century and recently rehabilitated. 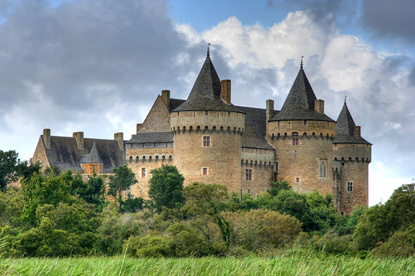 Erected between the 13th and 15th centuries, Largoët Castle played an important role in the medieval history of Brittany. Also known as the Elven Towers, the domain was purchased in 1656 by Nicolas Fouquet, two years before he started constructing Vaux-le-Vicomte.